When we finally arrived I thought that the Kings Arms looked like a typical country pub from the outside but I was pleasantly surprised when I walked in. I didn't manage to get a snap but the restaurant area was a mixture of modern white and original features with the most beautiful fairy lights and branches on the ceiling. The Christmas menu, which is available throughout December was a great blend of traditional and something a little different. Turkey and Christmas pudding were both on offer along with Chick pea, lentil and parsnip terrine and chesnut and whiskey cheesecake. I chose the sweet potato, squash and coconut soup to start as I thought it would be the lighter option, leaving more room for my main meal but boy was I wrong. 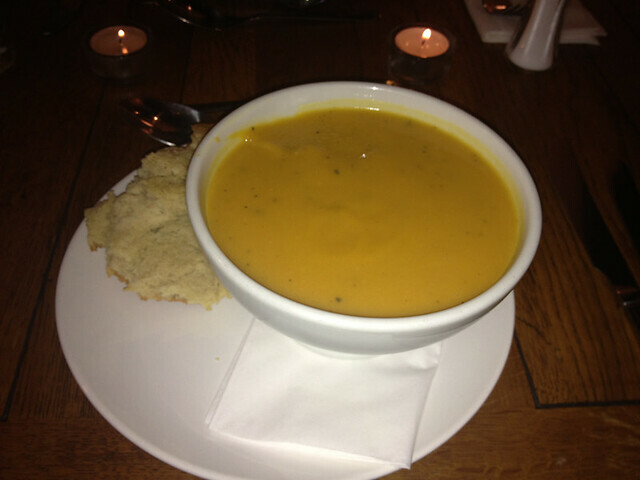 You got a huge portion of soup with some lovely warm, fresh bread. The soup would make a great lunch on its own, very tasty and all the flavours worked together well. Katilea chose the Arancini –deep-fried Hafod cheese and parsley risotto balls- with red chilli crème fraiche. The presentation was great and Katilea enjoyed the texture of the risotto balls but found that these cheese flavour wasn't very strong but the chilli crème fraiche made up for this. For my main I chose the Pan-fried Salmon with cockles and laverbread butter, wilted baby gem and truffle mash as I wanted to go for something a little different and I'm not a big meat eater. I've never had cockles or anything with truffle and I loved both. The mash had a hint of truffle that wasn't over bearing and I loved the salmon (such a large portion) which had a nice skin but was beautfully cooked on the inside. Katilea went for the more traditional roasted silverside of Breconshire beef with Yorkshire pudding and horseradish sauce. We both loved the fact that the meat on the menu was Welsh and that a lot of the vegetables came from local farms. 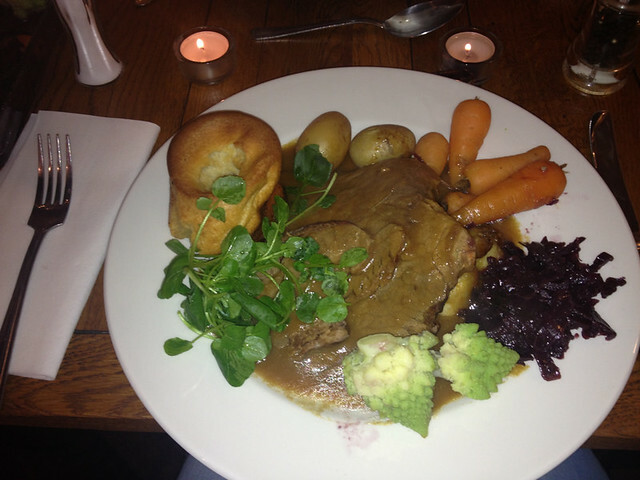 Katilea loved the thick gravy and the seasonal veg was cooked perfectly. She thought it could have done with some parsnips and we only realised that there were supposed to be some parsnip crisps with the meal once we had already both finished. 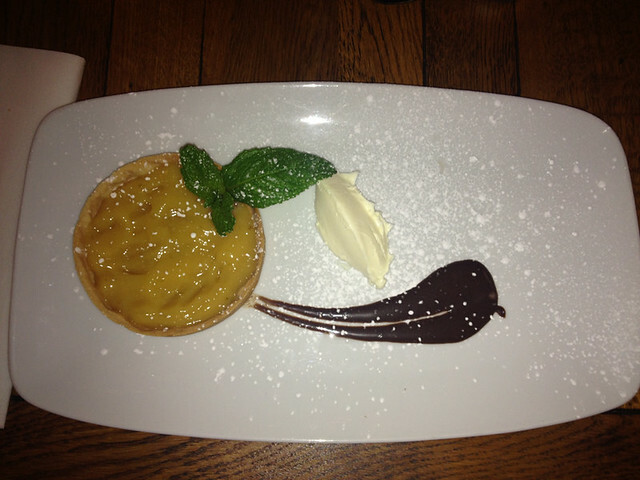 We both finised with the Lemon and lime tartlet with clotted cream and chocolate coulis. We both enjoyed it but thought that there was a tad too much lemon and lime filling. I wish I had tried the assortment of white chocolate, coffee and praline ice creams a lighter way to end a very filling meal. 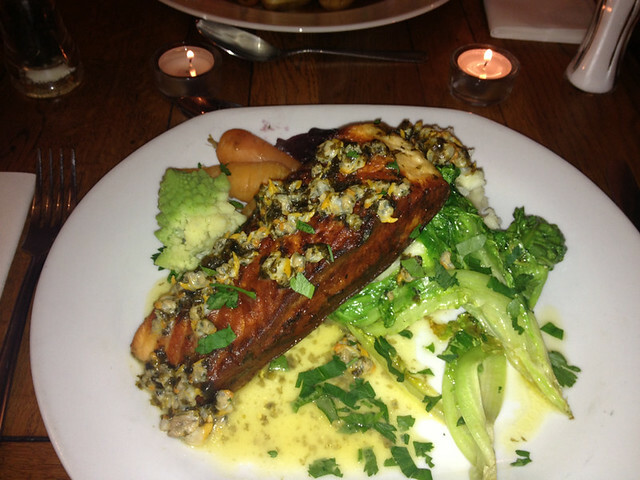 The Kings Arms Christmas menu is a very reasonable £22.50 for 3 courses. If you don't have time to visit in December I highly recommend you pop in on a Sunday for a roast dinner or pop into the cosy bar for a drink. It's located just on the outskirts of Cardiff and is easy to find as long as you can follow directions (not like me and Katilea). I really enjoyed my visit to The King Arms and hope to visit again in the new year. This food sounds amazing, that salmon sounds delicious!